The pet that's all wet! If the thought of a Liquid Mouse takes you back to that shockingly funny SNL Bass-o-Matic sketch, relax - Thanko is all about CUTE and their line of USB Optical Liquid mice (yes, there are 4) harms no animals in the making. An optical computer mouse isn't very space efficient because it has to fit the human hand. 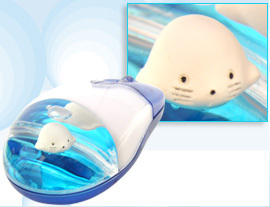 This leaves plenty of room for design innovation and Thanko has gone all out, creating a mini aquarium in the back of the mouse which holds one of four cute critters! Choose from a duckling, a frog, a seal or a penguin - if you can! Your funny floating friend needs no feeding and it won't grow - well, it'll probably grow on YOU as time goes by. Betcha you're thinking up a pet name for yours right now! Exquisite Japanese wrapping - of course!